Apart from that, you can enjoy any of our man with a van services in SE1, SE11 and SE17 at an amazingly low price. That also includes our professional end of tenancy cleaning and junk removal solutions. Even if you need to make a last-minute or same-day booking, you will have the opportunity to enjoy our wallet-friendly offers . While we have a great and well-organized man and van team in SE1, SE11 and SE17, we are a large and quickly developing firm that has coverage of different areas in South East London and Greater London. As a result, we can provide our customers with time-efficient and comprehensive local removal services. We have an armada of reliable transit vans and trucks that use GPS tracking. In that way, our vetted drivers are able to offer you a risk-free and speedy delivery and transportation of your furniture pieces and belongings. Our prices are always competitive, even if you want to book us for a full house removal. Elephant and Castle is located in South London and it is within in the London Borough of Southwark. The area is located close to key London areas, like the City, Westminster and the West End. Elephant and Castle is served by nearly 40 bus routes and two tube stations, which makes it incredibly well-linked to the rest of London. When looking to book a reliable and affordable man and van in Elephant and Castle, by all means turn to Atlas Man & Van as we have all the removal and delivery solutions you need under one roof. Whether you are shifting a couple of boxes up the road or relocating the entire contents of your home or office, we are able to do the job right and without costing you silly money. We are fully licensed and registered entity. The company holds all necessary insurance covering both main services and additional options. 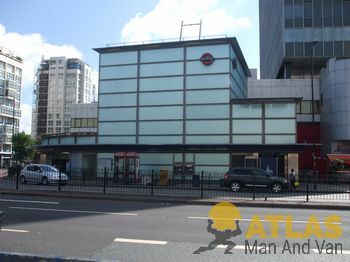 Elephant and Castle (known locally as ‘The Elephant’) has become the consolidated name for a local tube station, major road junction and the surrounding areas of a busy district in South London (just south of the Thames River). The peculiar name of the area originates from a popular coaching inn which once operated there.